Okay, so who’s having a week off? Anyway, I just had the itch to bake something today but not something sweet. Actually I was craving for a cheesecake but … nope, can’t eat. So I made something savoury instead. 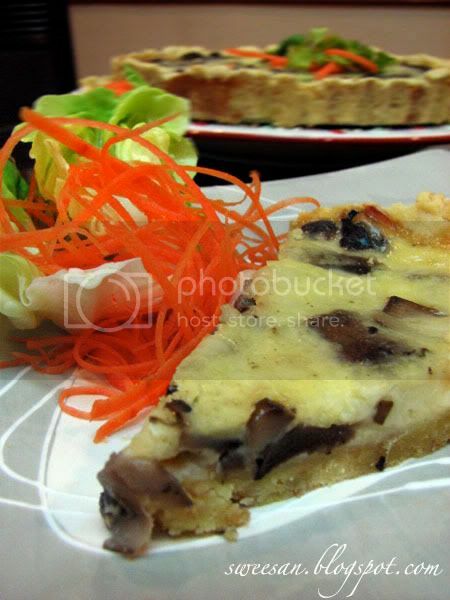 Well honestly, I’m not the greatest fan of quiche. Pies or vol au vents make more sense to me..
Sift flours into basin, return husks from sifter to basin, rub in butter, add egg yolk and enough water to just combine ingredients. Cover, refrigerate 30 mins. Roll out the pastry dough and transfer to a 9” flan tin. Bake blind for 12 mins at 175 C. Remove from the oven and cool the tart shell. Blend the cream and eggs together until smooth. Heat olive oil in a frying pan and sauté the garlic fragrant , add in the mushrooms and stir fry for 10-15 mins until they are tender and any liquid has evaporated. Add salt & pepper as per taste. 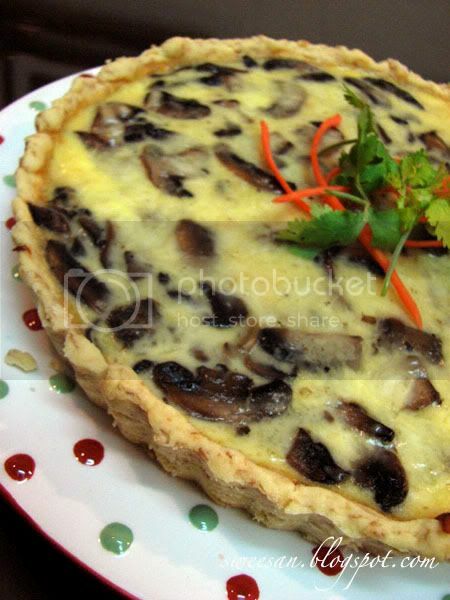 To assemble : Layer ½ of the mushroom mixture, half of the grated cheese mixture on the tart shell , repeat the layer process and fill up with the cream and egg mixture. Bake at 170 C for 20-30 minutes. « Who ate the cookie?